Roth firmly believes that your relationship with weight is a disguise for your relationship with yourself. “Assimilation of negativity” refers to a person’s willing, painful embrace of the sorrows of life, of himself and his flaws, in coexistence, almost union, with his confidence, aspirations, and joys. It is the opposite of splitting– the phenomenon of distancing our conscious self from unacceptable feelings and experiences to such an extent that a fissure opens between the conscious self and the unconscious self. With reality knocking at the door, the age-old message persists – “Accentuate the Positive! !”, if you don’t, there is no way to survive. The message of the Gospel – of God unjustly crediting us as good – allows us to unsplit (break down the wall, let the shark back in the water) and deal with the real troubles that we have long cordoned off and do so without being crushed and devoured. p.s. Confession: I shamelessly stole all of this and used it in a sermon recently. 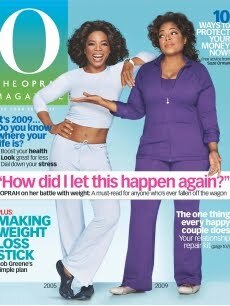 "Finally, Oprah left viewers with a burning question that she has clearly asked herself many times. 'Look into the mirror, and look deep into your eyes,' she said. 'Look beyond the flaws and the blemishes, look right through to your soul and ask yourself: What do you see? And can you begin to love that?" In my experience, no. I CAN'T begin to love that. Not on my own, anyway. Am I missing something here? Yeah, Margaret, I totally hear what you're saying. The reason I didn't quote the end of the article is because she blows it so royally with her overwhelming Oprah-ness. It just rings so false, esp after such an honest diagnosis. And the conception of God/the sacred/divine that they allude to is too silly to address… It's just nice that something other than inner strength gets lip service, period. That said, I don't think it'd be a stretch to say that some viewers would hear Oprah as the voice of God – and as a voice of love from outside, regardless of the go-get-em auto-suggestive content… And maybe there's some worth in that. STILL, the stuff about our relationship with food being a stand-in for our relationship with ourselves – indeed, food as a means or evidence of "splitting" from inner unpleasantness – is pretty insightful. I know it functions that way for me. And the self-medication/god-shaped hole talk is certainly not something you hear coming out of Oprah's mouth every day. All this to say, until she contradicts herself with the closing pep-talk, it seems to correspond pretty directly to the Mark 7 dynamic we talk about so often on here. Now if you'll excuse me, I'll get back to reading The Secret. And how did the sermon land? Any feedback? The best stuff in Christianity is all plagiarized. Steal away! One more: Do we observe the following here? 1. The diagnosis of the condition is apt. There is something seriously amiss with us (with Oprah more than her waistline), and we will do anything to not have to face it, both negatively (Double-stuff Oreos) and positively (the active resolve and repeated resolutions to be better accompanied by action, in this case dieting, etc.). Though I don't doubt that Oprah is the voice of (a) god for many, no voice is separate from what it says. Is it love when it points you to yourself? "'Assimilation of negativity' refers to a person's willing, painful embrace of the sorrows of life, of himself and his flaws, in coexistence, almost union, with his confidence, aspirations, and joys." "Wretched man that I am, who will deliver me from this body of death? Thanks be to God, through Jesus Christ our Lord!" This particularity of the "who" that brings deliverance, this knowing nothing but Jesus Christ and him crucified, is what makes this "assimilation of negativity" possible. The fat, however, will probably hold its own this side of heaven 🙂 That's the way it is with all "thorns in the flesh." Wow! Great post, Dave. Really interesting!